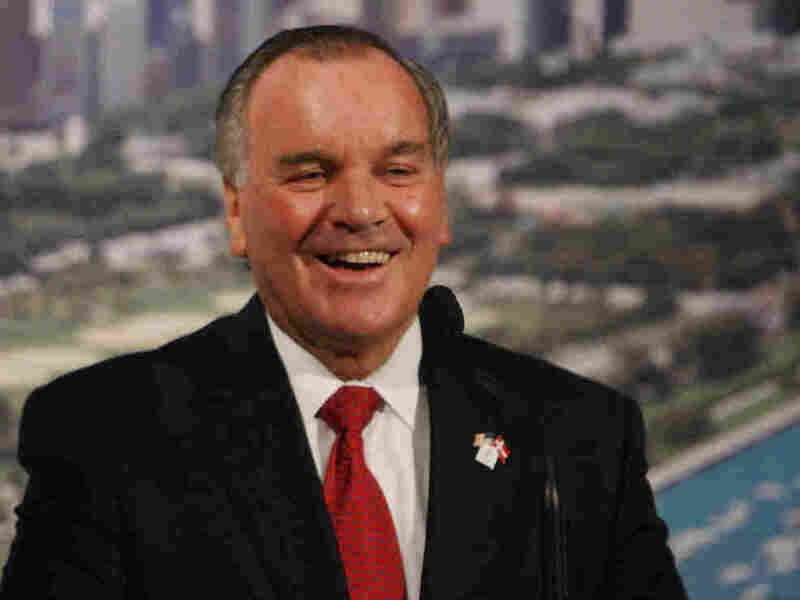 Chicago Mayor Daley Won't Run Again : It's All Politics Chicago Mayor Richard M. Daley, who has been in office since 1989 and who is set to break his late father's longevity record on Christmas, announced today he will not seek re-election in 2011. His father's mayoralty ended, after a record 21 years, because of a heart attack. The son, Richard M. Daley, has decided to leave on his own terms. First elected mayor of Chicago in 1989 and re-elected five times since -- the last three with more than 70 percent of the vote -- Daley announced today that he will not seek another term in 2011. At a City Hall news conference, Daley said, "In the end this is a personal decision, no more, no less. ... I've been thinking about this for the last several months. ... It just feels right." The poll found only 37 percent of city voters approve of the job Daley is doing as mayor, compared with 47 percent who disapprove. Moreover, a record-low 31 percent said they want to see Daley re-elected, compared with 53 percent who don't want him to win another term. The mayor's administration has been buffeted by a spate of summer violence, a weak economy and a high-profile failure to land the 2016 Olympics. Dissatisfaction abounds, the survey found, over Daley's handling of the crime problem, his efforts to rein in government corruption and his backing of a controversial long-term parking meter system lease. As I wrote in this space back in 2007 ("Chicago's Long-Running Daley Show"), Daley will break the record tenure for a Chicago mayor -- that of Richard J. Daley -- on Dec. 25, 2010. Daley's future political plans were part of a discussion earlier this year when White House chief of staff Rahm Emanuel, himself a former Chicago congressman, said his goal was to become the Windy City's mayor -- though he said he would never challenge Hizzoner for the job. Now he won't have to. Other potential candidates -- all Democrats -- include Cook County Sheriff Tom Dart, outgoing Cook County Assessor James Houlihan, former Chicago Inspector General David Hoffman (who earlier this year lost the Senate primary to Alexi Giannoulias), as well as a slew of city aldermen. No Republican has been elected mayor since William Hale Thompson, who won the job in 1927. That streak is expected to continue in 2011.